Every year, hundreds of tourists flock to the temple town of Udupi during Krishna Janmashtami. There are many vibrantly dressed troupes who take part in the celebration and collect small amounts of money for their art. Ravi Katapadi, , a resident of Katapadi, near Udupi, too was part of one such troupe. Due to his background of poverty, Ravi could study only till 9th grade. He started working right after school as a mason. Today he earns around 450-500 rupees per day but work is sometimes hard to find. Ravi has lost both his parents and lives with his brother and sister-in-law. Although leading a life of poverty, Ravi always had a smile on his face while going through his tiring daily work. 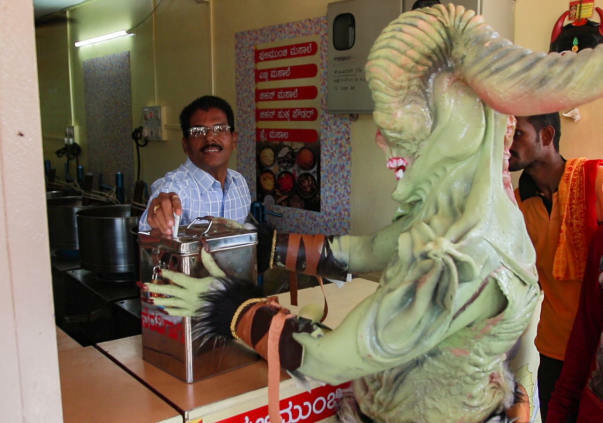 Everyone in Katapadi knew him due to his amicable nature. Five year ago, he came across the news of a baby with a dysfunctional hand on TV which quite literally drove the man to tears. Baby Anvitha had lost functionality of her right hand at the time of her birth, due to negligence on the doctor’s part. 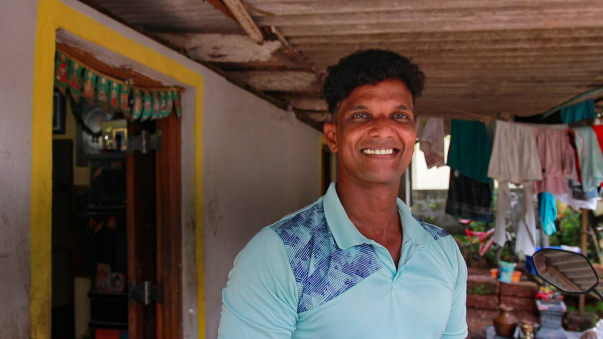 Ravi initially felt helpless in providing any support to the baby’s parents but then he thought what if he pledges all the money he is able to collect for his costumed act that year and donate to the parents for the baby’s surgery. The little one’s parents gratefully agreed. 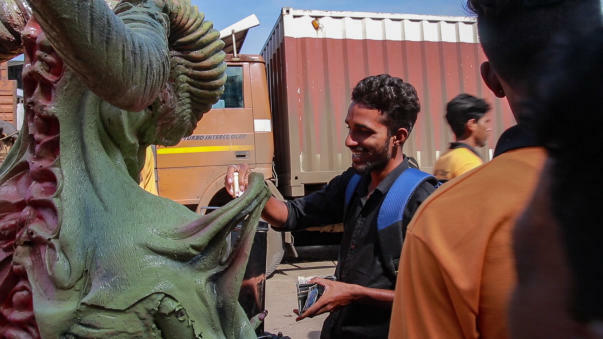 Conferring with his friend, who is an artist, on different costume ideas that would appeal to children, Ravi finally zeroed in on Faun, one of the characters that appeared in the film, Pan’s Labyrinth. 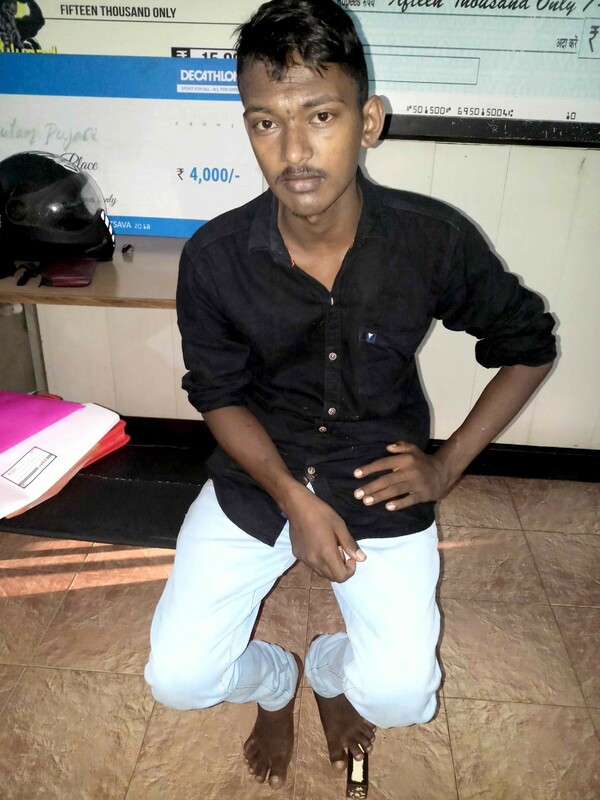 15 of his friends too agreed to join Ravi in his efforts and volunteered to support him in his efforts of collecting money for the baby’s surgery. Ravi spent 12 hours to put on the costume which had taken a month to design. He then wore it for 36 hours at a stretch during the 2 day Krishna Janmashtami celebrations and collected money across Udupi with the help of his friends. Hundreds of people from different backgrounds donated to Ravi's initiative, right from 5 rupees to 1000 rupees. To his own surprise, Ravi was able to collect more than 1 lakh which was enough for the baby’s surgery. Greatly moved by Ravi’s gesture, the parents willingly accepted the amount and the baby’s hand was treated. Today, it has been 5 years since the baby has been operated and the child can now comfortably use her hands. 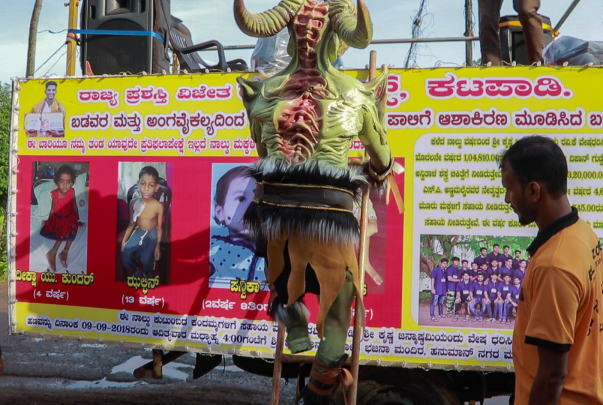 This had a huge impact on Ravi who decided to continue his efforts to provide help to as many sick children as possible through his costumed acts. Ravi has been donning amazing costumes for the last 5 years. 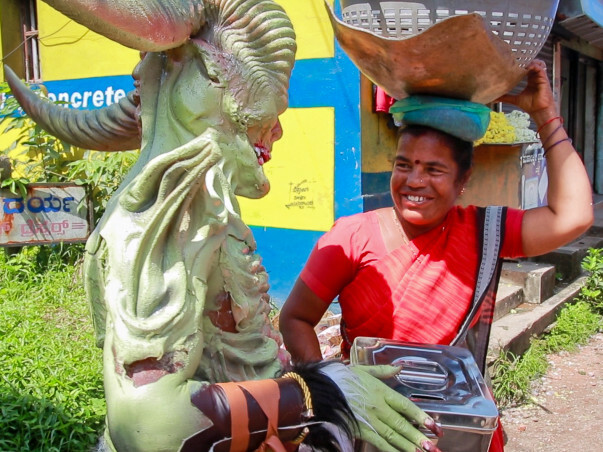 Having put paint directly on his skin as part of the makeup, Ravi has suffered from severe burns over the years. And it takes close to 20 hours to get done with the entire process, after which he has to further undergo toil that prevents him from even eating or drinking for three days. This does not deter him from undertaking his mission. He has helped 11 children get treated from 2014-2017. In 2018, this year, Ravi had donned the costume of monster and he was able to collect Rs. 5,32,000 for the treatment of 4 children which is an incredible feat. However, the money is not enough for the treatment of all 4 children. Zulphin, 13-year-old boy whose mother is a housemaid and father is no more. 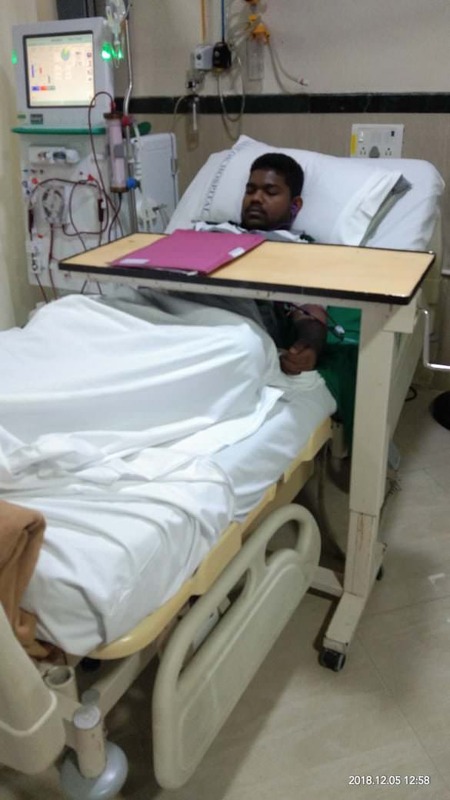 Needs transplant for both kidneys. Every month, the mother has to manage 25 k for medical expenses of Zulphin. Estimation for 2 kidney transplants is 12 lakhs. 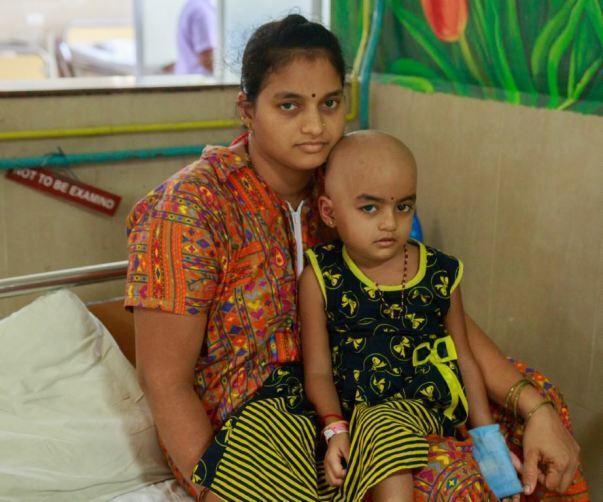 Panvika, 2-yr and 8 months old baby, is affected by Thalassemia. Her father is a waiter at a local restaurant. Estimation for treatment is 25-26 lakhs. Rajat, 10-yr-old boy, who is disabled as he doesn’t have strength in both legs. Estimation for treatment is 3 lakhs. Fulfill Ravi's desire to see these children get treated. 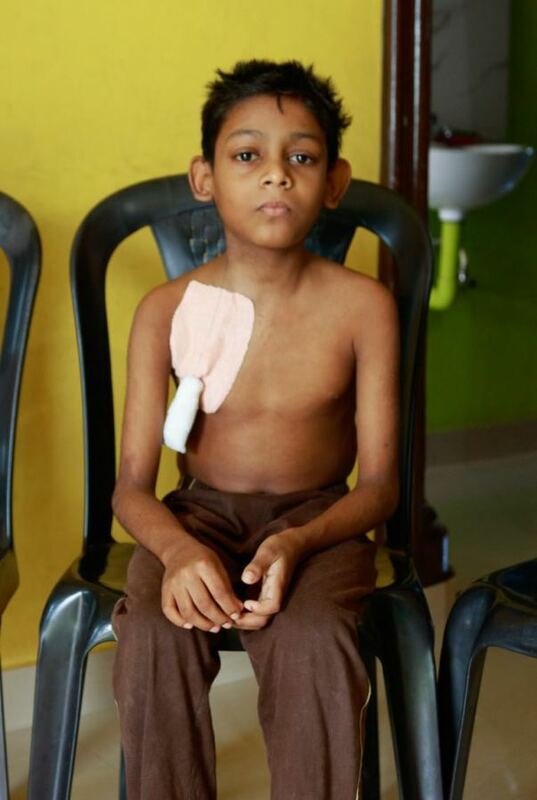 Your little support can ensure Ravi's dream of saving sick children is kept alive. Every small donation counts. Thank You for all the support. Here's an update shot by Milaap team in conversation with Mr. Ravi Katpadi. A heart felt thank you to all for the constant love and support! Ravi friends Katapadi have handed over Rs2,00,000 cheque to Mr.Sharan raised through Milaap. 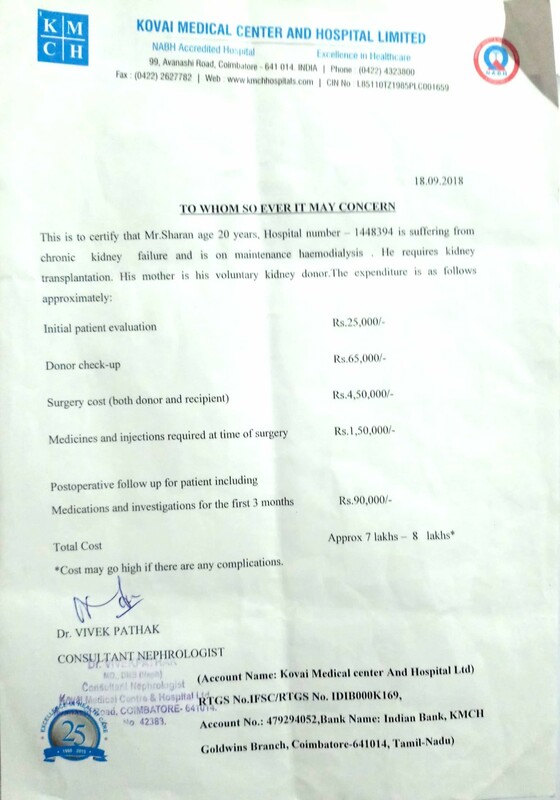 Mr.Sharan is a student and his both kidneys are not working .His mother is donating her kidney to his son .Total cost of the transplantation is Rs8,00,000 and we could give him Rs2,00,000 still he needs Rs6,00,000 for his surgery. Ravi Friends Katapadi have handed over the cheque of Rs1,00,000 to Mr.Goutham .Mr.Goutham a recently added beneficiary in our campaign .Goutham is getting his kidney transplantation from his own mother. Keep up the novel work.